I have decided not to eat rice for lunch when eating at this new-found "economy" rice place because I feel too full if I take rice with 3 dishes. Below are my chap fan (mixed rice) with no rice for last week. 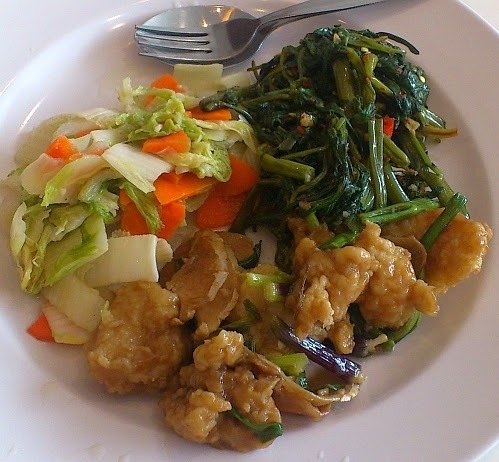 MYR6 - chinese cabbage (wong nga bak), water convolvulus (kang kung), fish slices with ginger and spring onion. 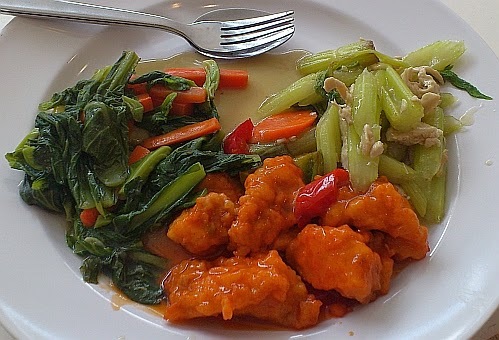 Yummzzz I like to take only the 'liew' and without rice too but if I'm hungry, then I need rice.. I can eat a lot of rice sometimes, hak sei my colleagues, hehe..
yummy! Each dish looks amazing! I'm sooo hungry right now..
You have very versatile taste in food. Very good. That all looks so healthy! Yum! As for me, I still prefer a little rice as vegetables alone can be a little salty. The dishes here are ok, not that salty. Does he charge you full portion rice price for half a portion? No rice = no carbs. Can ask for half or less. 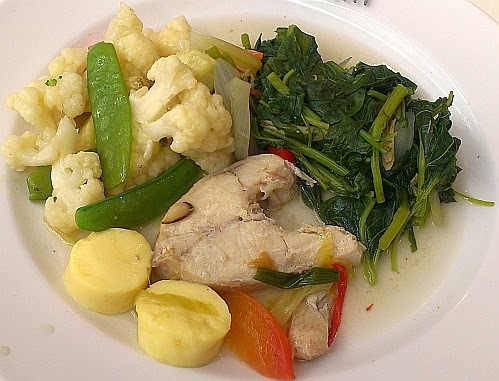 Aha, you may be surprised to know that some veges, sauce, gravy and meat contain carb too. I can only do that (no rice, I mean) when at home....coz then I can cook a lot more vegetables. Outside stalls give too little vege which is not enough to make me full (if I take more, got to pay more)! But I eat rice at home. Hehehe. That's how I eat too! normally i will take rice with the dishes. The chap fan dishes sometimes are too flavorful that needs to be neutralized by eating rice. Hehe and I will sometimes go "... add more rice"! Nice healthy choices you have there. I am a fish person too. Must have fish in my plate. Hehe. I never ordered economy rice without rice. Normally chap fan must have fan la. Looks at those generous portion of veggies! Did you ask for double? No. Those are single portions. 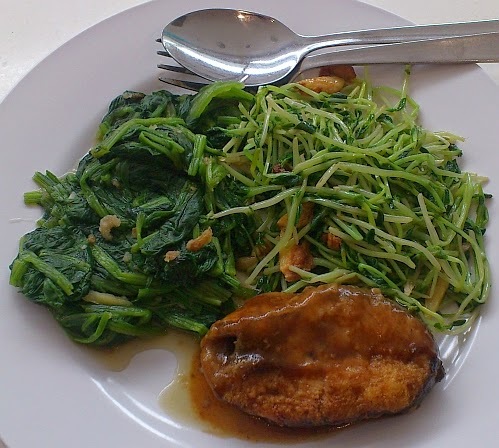 Each portion of vegetable cost MYR2. 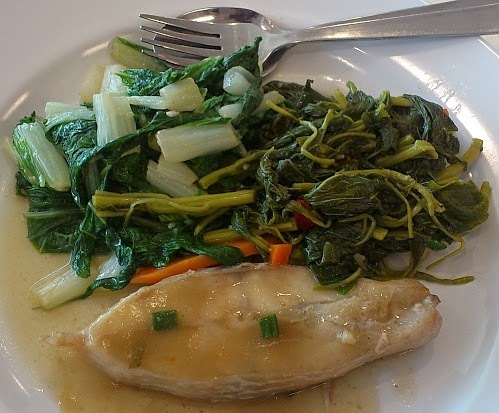 Mun, All those plates of veg and fish are to my liking...I have been taking chap fan without rice for my lunch and dinner, cutting down on my carb. What a clever title of just Mix with no Rice! My wife totally avoids carbo 100%!!! Your wife is really disciplined. I still can't totally cut all my carb. Mixed rice with no rice? It's the rice that makes me feel good and I usually get an extra portion. The prices are reasonable though, I just realize you take A LOT of veggies e.g. a large portion. The place I go to would probably charge RM 2-3 per portion if it's that much and the fish would be RM 4. Everything looks so good though, to be honest, mixed rice is my comfort food and I like eating it. This place charges MYR2 or MYR1.5 for a portion of vegetables depending on the type of vege. Wong nga bak is always MYR1.5 and the rest MYR2. Fish is always MYR3. Oh and they decide on how much is a portion. We consumers do not get to scoop the dishes.